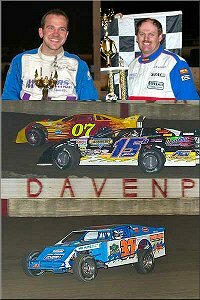 Davenport, Iowa: The 2003 racing season got underway on Friday, April 11th as Simmons Promotions presented the first of four Bud Open Late Model Shootouts at the Davenport Speedway. An outstanding field of 52 Iowa Illinois Taylor Insulation Late Models were on hand looking to qualify for the 50 lap main event and the $6,000 top prize that was awarded to the winner. The Hollywood Graphics fast dash pitted the top six in points earned through the heats in a race for starting position for the first three rows of the main event. Brian Birkhofer was aligned out side the front row of the dash by virtue of earning the fifth most points through his heat. �Birky� led the dash start to finish but was challenged very hard by Kelly Boen from Henderson Colorado. The 50 lap Bud Shootout feature took to the track with Birkhofer on the pole and Boen to the outside of the front row. Boen took off using the high side of the track and led the first fifteen circuits of the big half mile dirt track. Boen�s lead was being cut into by Birkhofer after lap ten, Birkhofer was able to use a move in turn two on lap 16 to take over the point and go on to the lead the remainder of the race. While Birkhofer was working through traffic a lot of good racing for position was going on amongst the top five. A lap 44 caution bunched the field together with 11 drivers remaining on the lead lap. Birkhofer was not seriously challenged the remaining six laps on his way to the win. Darren �The Thriller� Miller enjoyed an outstanding run in crossing the stripe in second ahead of the �The River City Hustler� Ray Guss Jr., Al Purkey made the long haul from Coffeyville, Kansas and ran a very impressive fourth ahead of Boen. The next Bud Open Shootout at the Davenport Speedway will be held on Memorial Day, Monday, May 26th. The Modifieds were also on the card on Friday night and another driver who has enjoyed a great deal of success at Davenport notched a very impressive win. Ron Barker started the 20 lap main in the seventh position and steadily worked to the front overtaking Mike Garland on the 16th lap on his way to the 20 lap feature victory. Garland ran second to Barker, Steve Wetter ran third ahead of Mike Zogg and Marty Thompson rounded out the top five.